Manual routing of international shipments relies on dumbed-down static routing guides, which tell overseas suppliers how to route freight. Because these guides can’t consider the many if/then variables that drive routing decisions, you lose the ability to align the service with the actual business need – an expensive limitation that can inflate global freight costs 7%–10%. Lost profit. When suppliers don’t know when the business actually needs the freight, there is an over-use of costly expedited shipments. Rigid, inflexible process. Your business needs change daily. But routing guides are nearly impossible to update daily or weekly. The tail is wagging the dog! Can’t leverage small parcel option. For smaller shipment sizes, parcel shipping can be 30% cheaper, in addition to being faster. With no minimum HBL charges and free entry and final delivery included in the rate, the weight at which switching to parcel makes sense is between 140–170 KGs. Check out our case study on how a Fortune 500 brand saved $1.3 million by shifting from air forwarders to parcel for lighter weight shipments. 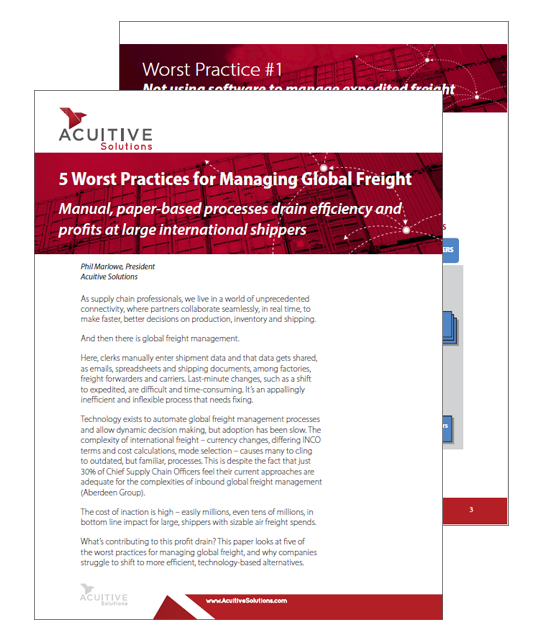 To learn more about the downside of manual routing, read our white paper: 5 Worst Practices for Managing Global Freight. Acuitive’s technology-based solution puts an end to static routing guides with an interactive TMS portal that gives shippers the ability to make dynamic routing decisions up to the last minute. A factory delay may bump a shipment from ocean to air. But if the factory is only one week late, you don’t need to go from 40-day ocean transit to 10-day standard air. You can book deferred air service and save at least 5%. Auto-routes to the lowest cost option that still meets the service requirement – smart systems allow all this to happen without any intervention by your team. 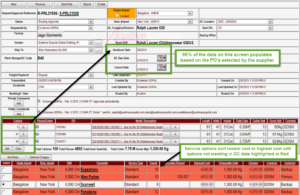 Maximizes flexibility – the platform is rules-based and highly configurable so you can program the system to account for a range of different scenarios, such as Divisional preferences. Reduce global expedited freight costs by aligning the service to the business need. Read Ralph Lauren case study. 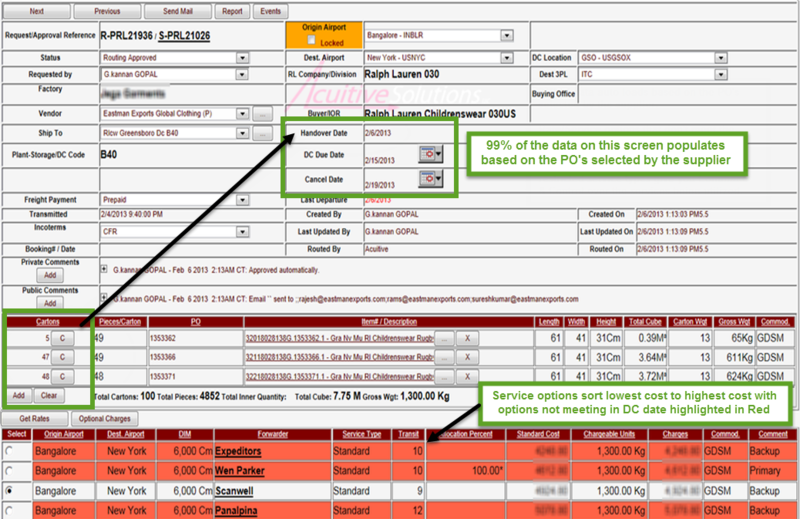 Improve inventory planning with visibility to PO/item/HBL before the shipment is on the plane. If you’re frustrated with manual routing processes for global shipments, we’d be happy to discuss how our TMS portal could improve your current process. Contact us to arrange a preliminary call.